In which G.M. Norton goes crazy about cravats. I simply adore cravats. They allow the wearer to still be properly attired even when the shirt collar is open. Cravats also conjure up associations of a winking Leslie Phillips or David Niven, which for me, is only a good thing! So you can imagine my joy when I received a cravat to review from Cravat Club. If you’re not familiar with Cravat Club then I recommend you visit their electronic site and immerse yourself in the world of cravats (unsurprisingly) and more recently, pocket squares. I’ve been casting furtive glances at their collection of silk accessories for quite some time. Aside from the array of interesting patterns and colours available, what sets Cravat Club apart from its competitors is that each and every one of their products is made in England. So not only do you get to ooze style and sophistication but you get to wear something made and produced right here in Blighty. The cravat I was lucky enough to receive is called the Tavus. A lovely paisley number, it is described as “black with deep red and vibrant orange”. I actually think it is blue, not black, but I’m not going to obsess over that colour conundrum and simply enjoy "neck perfection" (phrase pinched, thanks Albion). Priced at £70, even the 100% silk is woven right here in England. Or to be a little more precise, in the Midlands (before it goes through its preparation, dyeing and weaving stages). As well as jacquard woven silk cravats and pocket squares, Cravat Club also offer printed silk options. I understand that these are produced in T’North, where I reside. I am tickled pink with my new triangle of silk around my throat. As yesterday was 'Cravat Friday', I gave the Tavus its first proper outing. I was delighted to receive a whole heap of compliments from chums and strangers alike. It really did make a dashing alternative to a normal neck tie. I’m very fond of paisley and the colours complement many ensembles. I opted for a very pale pink shirt (acquired from the local Oxfam). These pictorials were taken after a hard day at the office, (hence the five o'clock shadow in the picture below) but the cravat looks as sharp as ever. Incidentally, please note that not a single hair is out of place on my Legends London covered head! I plan to pair the cravat with a number of different shirts and ensembles. Perhaps even with a polo shirt so keep those eyes peeled, chumrades. It has been an absolute pleasure to deal with Jenny at Cravat Club. The cravat feels so luxurious and the colours really are as vibrant as they look. 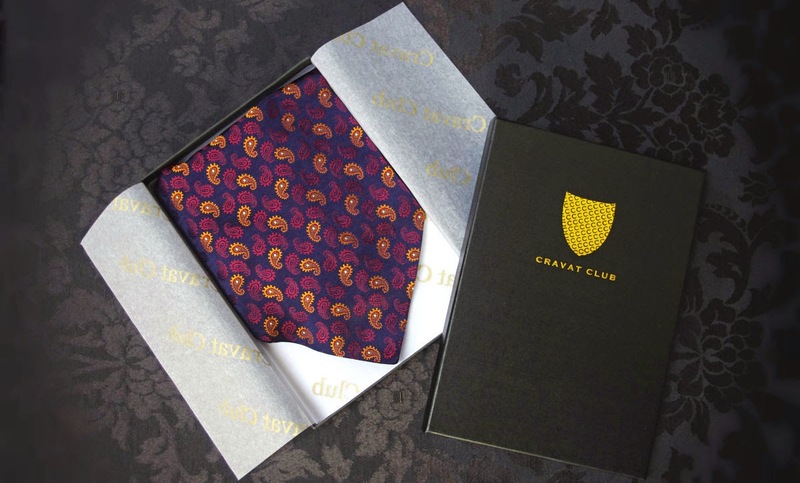 What’s more, the cravat arrives in an exquisite gift box, stamped with the Cravat Club shield. If you’ve never worn a cravat before, take the plunge! I insist. Terribly good of you, Porcelina! I'm sure you can use your womanly ways to steer him down the path marked 'Cravat'. Once you wear a cravat, there's no going back.